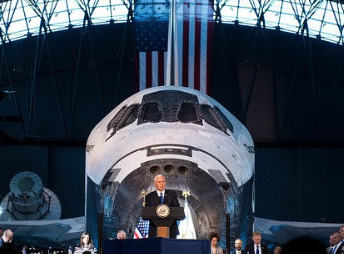 Vice President Mike Pence delivers opening remarks during the National Space Council's first meeting, Thursday, Oct. 5, 2017 at the Smithsonian National Air and Space Museum's Steven F. Udvar-Hazy Center in Chantilly, Virginia. The Commercial Spaceflight Foundation announced their support for the National Space Council, after the first meeting that took place. Washington, DC – Earlier today, Vice President Mike Pence chaired the first meeting of the National Space Council. The Space Council, comprised of numerous cabinet and agency heads, was briefed by industry leaders on topics of national security, civil, and commercial space. 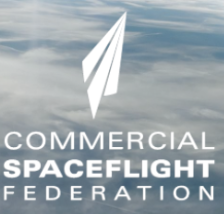 Blue Origin, SpaceX, and Sierra Nevada Corporation were among the Commercial Spaceflight Federation (CSF) member companies whose leadership briefed the Space Council. CSF also had a large contingency of member company leadership in attendance at the kickoff meeting. Eric Stallmer, President of CSF, who attended said that this Administration campaigned on an inspirational vision for America’s commercial space industry, and today’s National Space Council discussion represents a significant step towards furthering that goal, and they are encouraged by the dedication and interest demonstrated by the Council today. They look forward to engaging the Space Council to showcase America's commercial space technology, facilities, and expert staff, and collaborating with the Council to advance the Administration's space agenda. 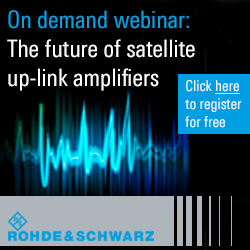 The Commercial Spaceflight Federation (CSF) is the leading voice for the commercial spaceflight industry. Founded in 2006, CSF and its 70+ members are laying the foundation for a sustainable space economy and democratizing access to space for scientists, students, civilians, and businesses. CSF is guiding the expansion of Earth's economic sphere, bolstering U.S. leadership in aerospace, and inspiring America's next generation of engineers and explorers.